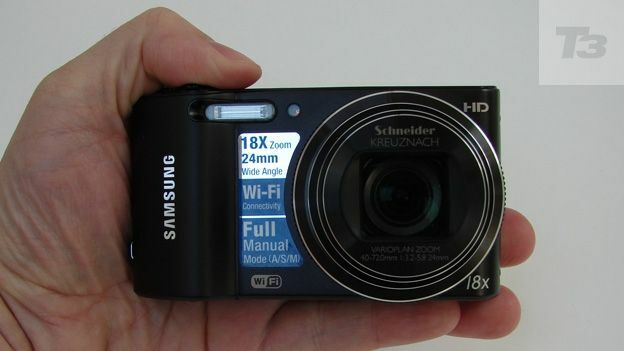 Is the £199 Wi-Fi enabled Samsung WB150F 18x travel zoom digital compact camera with 'smart' features the perfect holiday companion or excess baggage? Samsung's recent slew of compact cameras have stood out from the pack if not by design then by the icon-led layout of their menus and effects filters. These have increasingly been presented in the style of smartphone apps. Touch screens and elongated bodies on some models have further accentuated the link between phone and camera. So why buy a camera at all? Enter the 14.2 megapixel Samsung WB150F, which features familiar 'smart' features yet also, crucially, a sizeable image stabilised 18x optical zoom, manual controls and digital effects filters alongside its 'auto everything' options, plus Wi-Fi connectivity, making it a strong contender against the likes of the Panasonic Lumix TZ20 (and newer TZ30) . But has it got what it takes to make it into our list of the best digital compact cameras around? The lens here has a focal range the equivalent of a broad 24-432mm on a 35mm film camera, so we could squeeze a wide range of subjects into frame. While offering the above, the camera remains slender enough to slip into a back pocket or purse, with dimensions of 106.5x59.9x23.4mm at its slimmest point. It's well made and solid too, thanks to a higher proportion of metal in the build than one might expect for its £199 price point. With a subtly curved grip to one side, a usefully rough textured lens surround at the other provides a means of ensuring a tight and steady grip. This helped avoid blur when shooting handheld at longer focal lengths – a bugbear of small cameras with big zooms. In terms of external controls, the Samsung WB150F manages to pack in all the essentials yet maintain a clean, unthreatening layout with it. On the top plate there's a power button that activates the camera in under two seconds, plus a raised shutter release ergonomically encircled by a lever for zooming in or out. The camera takes four seconds to adjust framing from extreme wide angle to maximum telephoto setting. A five pence-sized shooting mode dial on the top plate makes for faster function access, and for those with a little more experience there are program, aperture priority, shutter priority and manual settings. Full auto operation is also provided courtesy of point-and-shoot Smart Auto, while Scene, camera Set Up and dedicated Video make up the rest of the shooting modes selectable via the same 8-option mode dial. The back plate features a dedicated camcorder-like video record button, located at the top right-hand edge where it falls under the thumbnail. You also get a familiar multi directional pad with flash, close up (to 5cm from a subject), LCD display and self-timer settings ranged around it. This is also used for tabbing through the additional function icons that are presented on screen with each twist of the mode dial. The WB150F is not a touch screen model however. Dedicated delete, playback and a back/return button all located via a thumb press at the rear further the Samsung's approachable feel. The WB150F offers the standard 3-inch back plate LCD presented in 4:3 aspect ratio; this being the default dimensions of a digital photograph. Turn the dial to video mode or press the backplate record button, no matter which alternative stills shooting mode is selected, and this view narrows with black bands cropping top and bottom to ape a 16:9 widescreen TV ratio. Thanks in part to a better than average 460k dot resolution, the Samsung's screen appears bright and clear in use, and images look great – even when panning through scenes indoors there's no obvious screen lag; it's as fluid as we could hope for. This being an inexpensive pocket camera, there is no optical or electronic viewfinder to alternatively fall back on, which would have only added unwanted bulk. The Samsung WB150F comes packing a SLB-10A lithium ion rechargeable battery, inserted into the base of its curved handgrip. Still images and video on this Samsung are written to either 18MB internal memory or – preferably – optional SD/SDHC/SDXC cards. Predictably the card in use shares a covered compartment with the battery at the camera's base. Battery life is good for 270 pictures from a full charge or 110 minutes of video, with a mains adapter plug into which slots the USB lad provided instead of an actual standalone charger. The 1/2.3-inch CCD sensor incorporated by the WB150F isn't especially large, so we're not expecting DSLR-quality at a bargain price here. However with the camera left on its default settings Samsung does deliver when it comes to bright, colour rich images that need the minimum amount of tweaking straight out of the camera. The low light range is respectable enough too in theory, stretching from ISO80 through to a top whack ISO3200. However, we noticed a softening of detail above ISO400 to limit noise, which is fairly low, with the result that we get images with a washed out watercolour-like appearance at the maximum ISO3200 setting. On this model Samsung is offering 1280x720 pixels HD video with mono sound at a capture rate of 30 frames per second (fps), rather than the Full HD 1920x1080. Pay a little more for the WB850F model to get Full HD. Fortunately here the optical zoom can be used when recording video, with the focus automatically altering too, though we found it a bit sluggish to catch up when altering framings. While the extra long zoom here is suitable for framing up a wide variety of subjects in seconds, from expansive landscapes to candid close ups from afar, thus making the WB150F a suitably inexpensive travel camera option, it misses out on the likes of GPS offered by more expensive rivals, such as the more sophisticated Panasonic DMC-TZ30. That won't bother everyone of course and for the price you get what you pay for with this Samsung, with a few manual creative features and convenience aiding tools such as Wi-Fi connectivity thrown in. While image quality is perfectly fine when there's plenty of light around, it suffers in low light and we wouldn't advise straying higher than ISO400 if you want the best results. Still the price is fair, the plethora of digital effects are fun if inessential and it ticks the box for ease of use.